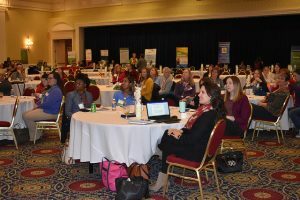 ALEI Legal Specialists Sarah Everhart and Nicole Cook spoke at the Mid Atlantic Women in Agriculture Annual Conference in Dover, Delaware, February 9, about the Food Safety and Modernization Act (FSMA). The goal of FSMA is to ensure U.S. food safety by preventing food contamination, according to the Food and Drug Administration. The Preventive Controls Rule focuses on food processing. While farmers are generally excluded from this rule, farmers who process food must adhere to the new law, Everhart said. “People still lack the knowledge about what the rules are,” said Everhart. “Our goal in presenting on this topic is to educate farmers as to what the Produce Safety and Preventive Controls Rules are and to whom each law applies.” Additional information about the rules may be found on the food safety page of ALEI’s website and on the Maryland Risk Management Education Blog. ALEI’s Program Coordinator Kimberly Johnson also attended the event, hosting a table representing ALEI. “It was a great opportunity to connect with existing partners and colleagues as well as to establish connections with new audiences,” said Johnson. Women in Agriculture’s mission is to Educate, Engage and Empower. Approximately 180 individuals attended the event from a range of backgrounds. Some were farmers or service providers, and others work in government or in the private industry. AGNR Extension Educator Shannon Dill organized the event. Once again this winter the ALEI legal specialists traveled to all corners of the state to speak at Agronomy Day workshops. We submit educational presentation proposals to University of Maryland Extension staff in the fall and, if the Extension agents feel the presentation topics will be of interest to farmers in their region, they invite us to speak at the winter events. At Agronomy Days, we are often on the agenda alongside scientists from the University of Maryland who inform farmers on the latest results of agriculture studies and trials. At ALEI, we know it can be hard for farmers to find time to devote to continuing education. We try our best to create and present timely, interesting and useful legal presentations. Kelly Nuckolls Winslow and Sarah Everhart discussed “Easements & Rights-of-Way in Maryland” at the Washington County and Cecil County Agronomy Days, respectively. The presentation was created based on repeated questions from farmers about what they can and can’t do in areas of their farms under easement and the extent of their maintenance responsibilities in right-of-way areas. Winslow and Everhart were peppered with questions at both locations and hope operators left with a better understanding of this important topic. Winslow and Paul Goeringer gave attendees at the Northern Maryland Field Crops Day and Carroll, Cecil and Queen Anne’s County Agronomy Days an overview of “Pesticide Drift Liability”. Winslow and Goeringer explained to the farmers in attendance the causes of action a person impacted by a pesticide drift claim may pursue, and ways to avoid being found liable for pesticide drift damages. Goeringer also discussed “Seed Saving Laws” at the Central Maryland and Harford and Cecil County Agronomy Days. Goeringer has been educating farmers about this topic for the last few years and hopes that his efforts will prevent farmers from violating federal laws protecting seeds. Winslow also shared her valuable tax knowledge with farmers at the Baltimore County Agronomy Day during her “Estate and Other Death Taxes” presentation. Farm related estate planning is a priority for many of Maryland’s farmers and Winslow gave attendees an overview of the major areas of estate related tax consequences and strategies to reduce estate tax exposure. Everhart and Nicole Cook gave programs about the Food Safety Modernization Act (FSMA) and the Produce Safety Rule to operators at the Cecil and Lower Shore Agronomy Days. Although signed into law in 2011, FSMA and the Produce Safety Rule are only recently affecting Maryland’s farmers. Everhart and Cook present on this topic regularly to let farmers know what the law covers, who the law affects and what growers who are subject to the law need to do to be in compliance. Cook also presented at the Mountain Top Fruit and Vegetable Growers and the Dorchester County Vegetable meetings on “Structuring Your CSA Member Agreement “ and “Legal Considerations for Farm Marketing” These presentations provided growers with knowledge related to protecting their farms from the risks that come with direct farm marketing. Although travelling long distances in the winter to speak to farmers can be arduous at times, we relish the opportunity to present information that farmers can take home to strengthen their operations. It also provides us with a nice opportunity to chat with farmers and hear about legal needs and concerns. If you have a legal topic that you would like us to cover at an Agronomy Day or in another way (article, webinar, blog post, etc. ), please don’t hesitate to get in touch with us via email at umaglaw@umd.edu or by phone at 410-706-7377. Extension Legal Specialist Kelly Nuckolls Winslow presented at three sessions of the January 8 to 11 Delaware Agriculture Week in Harrington, Delaware. The event covered a range of topics, from beef and fruit production, to soil health and agronomy. During the poultry session, Winslow focused on legal issues poultry farmers face in the Delmarva area. In the risk management session, she spoke about long term health care planning and state estate recovery. She discussed seed saving laws at the soybean session. Winslow will return to the Delaware Agriculture Week next year and continue contributing resources to Delaware farmers. Extension Legal Specialist Paul Goeringer attended the 2018 American Farm Bureau Federation (AFBF) Annual Convention & IDEAg Trade Show from January 5-10 in Nashville, Tennessee. It was the 99th consecutive American Farm Bureau Federation’s Annual Convention & IDEAg Trade Show, with approximately 5,000 attendees. Goeringer and Agricultural Law Specialist Tiffany Dowell Lashmet of Texas A&M University gave a legal update for 2017 and discussed topics that would be important in 2018. “We went over what is still undecided from last year that will be decided on this year,” said Goerginer. Topics covered included water rights, dicamba drift, and a possible syngenta settlement. The 45-minute presentation, attended by about 90 people at the convention, is now available online as a podcast at https://go.umd.edu/AFBFpodcast. The event gave Goeringer an opportunity to hear different perspectives from people across the country on how the issues he discussed would impact them, and receive feedback about the programs he works on. “The conference had two purposes: to provide educational training to American Farm Bureau members and, at the same time, have members vote on specific proposals they think Farm Bureau should take up,” said Goeringer. Other speakers at the convention included Senator Jerry Moran from Kansas, who gave a farm bill update and spoke about how some issues still need to be dealt with. Another speaker was Dr. Keith Coble from Mississippi State, who discussed other farm bill issues and how committees will deal with them as compared to producers.